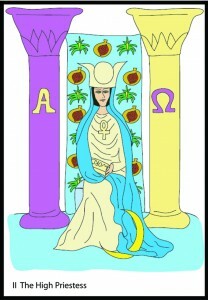 If your tarot number adds up to 2, your personality and soul is represented by the High Priestess. Wisdom and refined receptivity define your basic nature. Not one to make a scene you quietly and carefully take note of everything around you. Sensitive to the subtlest of energies, you can be depended upon to notice what most of us miss. Your quiet patience and virtuous demeanor often set you on a pedestal people are grateful to bow before. Your intuition is strong and you tend to use your feelings at least as much as your fine intellect when making decisions that matter. Those represented by the High Priestess have the gift for seeing the whole picture without getting swamped by the details. The High Priestess is the soul symbol for both the Strength and Judgement personalities.